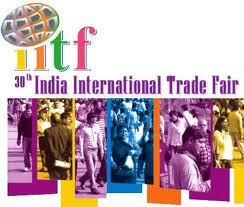 One of the buzz around Delhi these days is the IITF 2010. Held every year at Pragati Maidaan New Delhi, the fair offers a chance to domestic as well as international businesses to display their products and services with a particular theme. This year’s theme is ‘Clean and Energy Efficient Technology Products’. So got a chance to visit the fair last week when hubby got passes from one of his colleagues. It was a exciting as well as disappointing experience. At starting the whole enjoyment was ruined by unseasonal rainfall. Where some of the state pavilions had nothing to display, others had much to show. Visited Delhi, Haryana, J&K, Punjab, Gujarat, Rajasthan, U.P., A.P. and International partners pavilions. Most of the pavilions had same clothes, jewelery and household items. Bought some household things, floor mat from Rajasthan, vase, artificial flowers and a hand bag from Thailand and a bed sheet from Pakistan. Pakistani stalls were flooded with beautiful hand embroidered bed sheets, bed covers, dupattas, ladies suits and men’s wear. International player’s pavilions had more to offer as compared to domestic ones which was also the reason behind more crowd there. During our schooldays there was a charm for visiting Trade fair every year and we had one day school trips to trade fair also but nowadays the fair is loosing its appeal. May be its due to a difference in thinking being a school kid and a grown up adult.